Rob Roy and William Wallace stayed here. 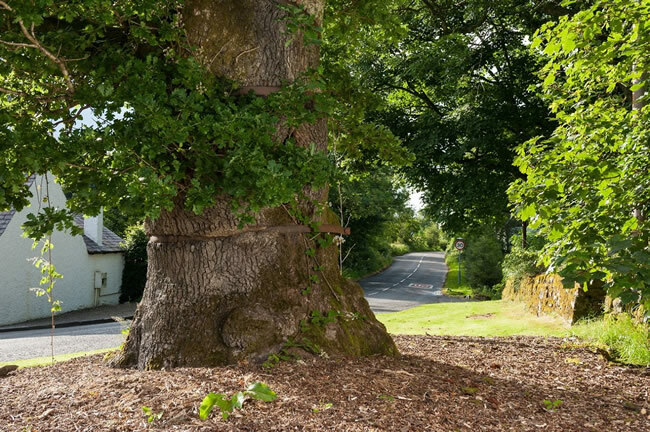 The village symbol, The Clachan Oak, is said to be over 500 years old, and allegedly sheltered both Rob Roy Macgregor and William Wallace under its branches (although not at the same time). The name Balfron is derived from ‘Bail’-a-bhroin’ or the ‘village of mourning’. Legend has it that wolves once descended from the nearby Campsie Fells and devoured the local children. It’s a myth, but it gets the kids to bed at night. It’s the birthplace of Alexander ‘Greek’ Thomson. The famous architect whose classically-inspired work has been perhaps unfairly overshadowed by the Macintosh legacy was born in the village. It once had its own railway station. Balfron Station still exists as an address. Those in the know can trace the profile of the original railway line that wound its way through the hills. Cotton St, Spinner St, Weavers Winnel, are names that attest to the importance of the cotton works that Robert Dunmore founded in the village. At its height it employed over 400 people. During World War 1 ambitious plans were laid for a massive ship canal linking the Clyde via Loch Lomond through Balfron to the Firth of Forth in order to move warships swiftly across Scotland. Had it gone ahead then we’d all be selling ice creams to cruise passengers instead of organising hilly 10ks. Aye Wright … Balfron was nearly site of the first ever manned flight! Harold and Frank Barnwell, contemporaries of the Wright Bros., were magnificent men who experimented with their flying machines in the fields around Balfron. The undulating (hilly) terrain provided ideal launch sites! Our annual village festival, The Balfron Bash, takes place just before the schools go back in August. Last year the sun shone … briefly, on the nearby hills. Incredible Edible Balfron is a delicious initiative which has seen local people replant municipal flower-beds with ‘pick-your-own’ fruit and veg.